Peppermint (Mentha piperita) is a hardy perennial herb that is a hybrid of watermint and spearmint. It's native to Europe, but can be found all across the world. With a long history of therapeutic use for a variety of ailments that extends back to ancient Egypt, peppermint is referred to as "the world's oldest medicine." Nutritionally, peppermint offers vitamins A and C, iron, potassium, fiber, and it's low-calorie. Its refreshing flavor and cooling sensation lead to its inclusion in many products including mouthwash, toothpaste, soap, and ointment. Regardless if you obtain it from your local farmer's market or grow it in your own herb garden at home, peppermint leaf offers many amazing health benefits. Peppermint or extracts of compounds from peppermint leaf, including menthol, can help defend against many types of harmful organisms. It's been evaluated against head lice, fungus, and even worms that reside in goat intestines — all with positive results. Appreciation for peppermint's qualities as a digestive aid extends back hundreds of years. Recent studies confirm peppermint tea is helpful for relieving indigestion. Peppermint may also ease various symptoms of IBS, including abdominal discomfort, gas, and diarrhea. You can breathe easy knowing that peppermint supports lung health and respiratory function. Peppermint may even boost lung function during exercise. In a study of 12 healthy males, consumption of peppermint-infused mineral water lead to a measurable increase in respiratory rate and running performance — likely due to increased oxygen concentration and decreased blood lactate levels. Peppermint is frequently added to toothpaste, mouthwash, and floss. Although its minty flavor keeps your mouth smelling fresh and feeling clean, it has an even greater effect. Studies show that peppermint encourages a healthy oral environment by fighting plaque and supporting gum health. Others studies suggest peppermint keeps the mouth clean by inhibiting the growth of bacteria and oral pathogens. Peppermint is a fantastic natural remedy for tension-type headaches — the most frequent type of a headache. In fact, by some accounts, peppermint oil can relieve a headache as well as aspirin and acetaminophen. Peppermint has a soothing action and is recommended by aromatherapy practitioners for relieving feelings of stress and anxiety. Peppermint may support liver function by promoting the flow of bile. Bile helps digest fats and encourages normal cholesterol levels; normal cholesterol levels reduce the workload placed on the liver. Additionally, animal studies show that compounds in peppermint leaf may protect the liver against certain toxins. 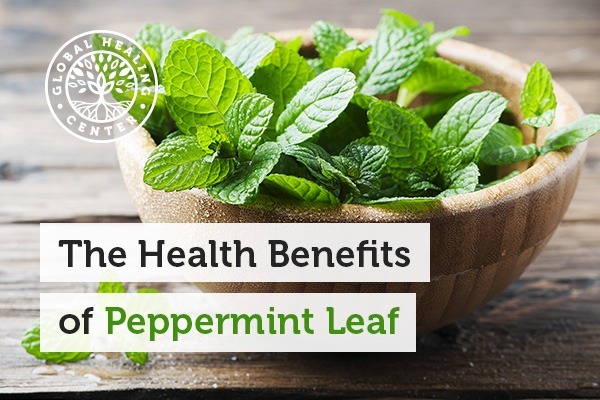 While more research is required to explore this relationship, early investigations about peppermint's ability to support liver health are positive. Peppermint tea, one of the most consumed herbal teas in the world, contains antioxidants. Traditional folk medicine recommends peppermint for relieving discomfort, a claim that has been investigated and substantiated. Peppermint has a relaxing effect on smooth muscle tissue. There are many situations where relaxing smooth muscle tissue is beneficial, whether it be relieving a sore throat, or calming colonic spasms during barium enemas. Some studies suggest that certain compounds in peppermint, in certain situations, may promote normal cell growth and development. Peppermint is a fantastic and valuable addition to an organic herb garden. It repels insects and requires minimal care. Once established, peppermint grows rapidly; some gardeners might say it grows a little too easily. True peppermint is not grown from seeds. As a hybrid plant, most peppermint plants are sterile. Unscrupulous sellers still offer something called "peppermint seeds" but I wouldn't recommend purchasing. They either won't germinate or aren't true peppermint. If they do germinate, what grows may be a mint, but not peppermint. The taste, smell, and therapeutic properties will be different-and probably not as pleasant. True peppermint is grown only via cuttings. 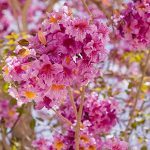 You should be able to find some at your local garden shop, or from a green-thumbed friend who already possesses a peppermint plant. Perform a taste test on a leaf first. The plant you grow will effectively be a clone of the original and should taste exactly the same. Plant in early spring. The cuttings prefer a temperature of at least 65°F (~18°C). If the temperature outside regularly falls below that, you can start the cuttings inside your home, but once the cuttings reach 10 cm in height, it's time to move them outdoors. Peppermint prefers moist, but well-drained, soil and full or partial sunlight. The plants will grow about 1-2 feet in height and completely cover the ground. Like most mint species, peppermint is invasive and, if you aren't careful, it will take over your whole garden. 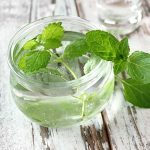 For this reason, many gardeners prefer to grow peppermint in a container or in an enclosed area on the ground to prevent the roots from spreading. Peppermint leaves can be harvested as soon as they begin growing. The new leaves will have the best flavor. When harvesting, leave at least 1/3 of the plant intact. The essential oils of mint are most potent when harvested in the morning after the dew has dried. Dry peppermint leaves quickly after harvesting, as they tend to mold quickly. Peppermint may be air dried by tying the stems into bunches. Hang the stems upside in a paper bag, in a cool, dry place. After two weeks, the herbs will be dry and ready to store. If stored in an airtight container, the herb should remain fresh for up to three years. Peppermint leaf is used in many ways. Add the leaves to salads or make peppermint tea. Even adding peppermint leaves to purified water, is cooling and refreshing. Chewing peppermint leaves is an easy way to naturally freshen breath. If you want the benefits of peppermint leaf without the hassle of growing or preparing it yourself, peppermint oils and peppermint leaf extract are a great alternative. Global Healing Center offers an array of products that contain high quality, organic peppermint extract. Allertrex® supports respiratory health, and Livatrex® promotes optimal liver function, and both harnesses the power of peppermint and other organic herbs to support your health. What's your favorite use for peppermint? Leave a comment and let us know your thoughts! De Almeida MA, et al. "[Effects of aqueous extracts of Mentha piperita L. and Chenopodium ambrosioides L. leaves in infective larvae cultures of gastrointestinal nematodes of goats]." Rev Bras Parasitol Vet. 2007 Jan-Mar;16(1):57-9. Portuguese. Cappello G, et al. 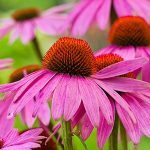 "Peppermint oil (Mintoil) in the treatment of irritable bowel syndrome: a prospective double blind placebo-controlled randomized trial." Dig Liver Dis. 2007;39(6):530-6. Shkurupiĭ VA, et al. "[Efficiency of the use of peppermint (Mentha piperita L) essential oil inhalations in the combined multi-drug therapy for pulmonary tuberculosis]." 8 Probl Tuberk. 2002;(4):36-9. Aspalli S, et al. "Evaluation of antiplaque and antigingivitis effect of herbal mouthwash in treatment of plaque induced gingivitis: A randomized clinical trial." J Indian 11 Soc Periodontol. 2014;18(1):48-52. Thosar N, et al. "Antimicrobial efficacy of five essential oils against oral pathogens: An in vitro study." Eur J Dent. 2013;7(Suppl 1):S71-7. Göbel H, et al. "[Peppermint oil in the acute treatment of tension-type headache]." Schmerz. 2016;30(3):295-310. Zong L, et al. 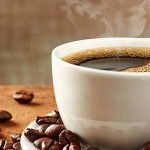 "Preliminary experimental research on the mechanism of liver bile secretion stimulated by peppermint oil." J Dig Dis. 2011;12(4):295-301. Sharma A, et al. "Protective effect of Mentha piperita against arsenic-induced toxicity in liver of Swiss albino mice. Basic Clin Pharmacol Toxicol." 2007 Apr;100(4):249-57. Jain D, et al. " Evaluation of cytotoxicity and anticarcinogenic potential of Mentha leaf extracts." Int J Toxicol. 2011 Mar;30(2):225-36. doi: 10.1177/1091581810390527. Epub 2011 Feb 7.